a chess program written by William Fink. 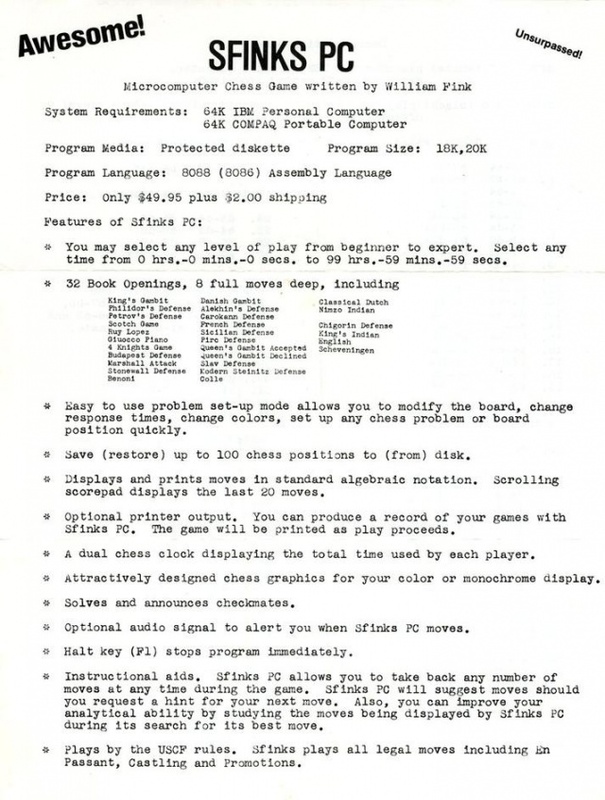 It was one of the early commercial chess programs for IBM PC's  , written in Assembly for 8-bit Z80- and 16-bit 8086 microprocessors subsequently, and participated at the MCC 1980, the ACM 1982 and the WCCC 1983 with the 8-bit version running on an TRS-80 microcomputer. Sfinks was a modern full-width alpha-beta searcher with iterative deepening and small refutation tables with very moderate memory requirements to store two additional moves of a principal variation for each root-move . Despite embedding its authors name, Sfinks is the Polish spelling for Sphinx, the mythological creature of Ancient Egypt and Achaemenid Empire that is depicted as a recumbent feline with a human head. This page was last edited on 27 November 2018, at 23:32.